"The Annual General Meeting of the membership shall be held during the yearly CPN Conference. The preferred time is in the spring of each year at a date and place (region) as pre-selected at the AGM during the previous Conference and at the bidding of the BOD. This will include early notification and an invitation to CPN members of the specific region (Europe/North America incl. Mexico/Central and South America/Middle East and Mediterranean/Asia/Indian Sub-Continent. Interested members will then be given a specific timeline to submit their interest to host the CPN Conference. Such expression of interest should be accompanied by a presentation of the proposed venue, capabilities, support from local authorities, possible sponsors etc. 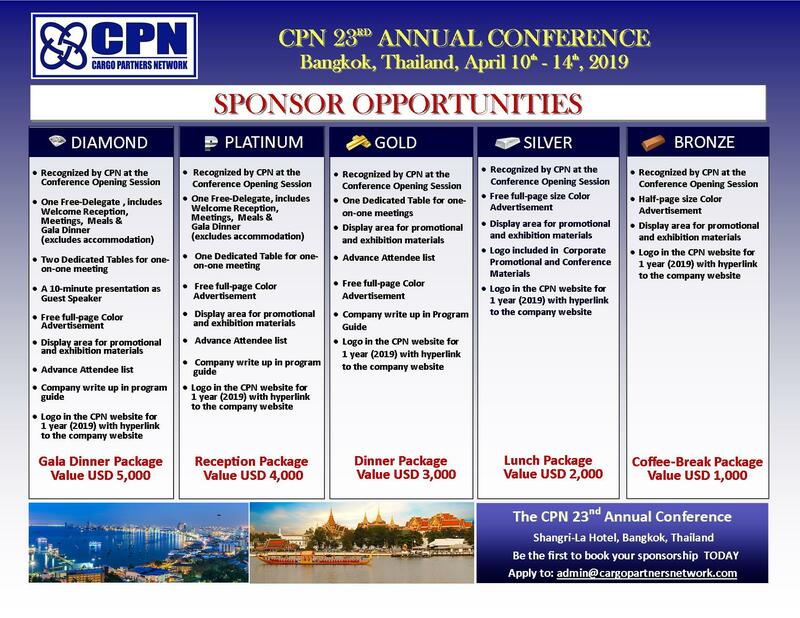 Attendance of the annual CPN Conference is mandatory for all CPN Members. Only once in 5 year period, a member can ask for a waiver on the ground of extreme emergency. Only CPN Board will have the discretion to consider the request of waiver. Non-attendance will lead to a risk of automatic membership cancellation. In addition, when a company exceeds the permitted quota of once in 5 years under “extreme emergency” and fails to attend the Annual General Meeting, the condition of exclusivity for this company’s territory will be revoked and the Board of Directors will be allowed to set up a process for seeking an additional member for the involved territory, so this territory is always represented and the continuity of the CPN business on it is guaranteed." A luxury five-star riverside hotel in Bangkok. Shangri-La Hotel, Bangkok is a commanding landmark nestling on the banks of the Chao Phraya River, offering a strategic, luxury haven to call home in the city. The hotel has 802 elegant guest rooms and suites featuring a compelling blend of traditional Thai décor and modern comforts, each with alluring views of the gardens, city or river. Two outdoor swimming pools are surrounded by verdant tropical gardens providing a serene urban escape to relax and rejuvenate. Delivering authentic Thai hospitality with a comprehensive array of business and leisure amenities, Shangri-La Hotel, Bangkok is also a renowned culinary hub showcasing the eclectic flavours of Asia and beyond. Please Note if any booking cannot be made on pre & postdate, please make direct booking to their reservation team at delphigroup.slbk@shangri-la.com and reservations.slbk@shangri-la.com and mention the booking “Cargo Partners Conference 2019”. - The Ministry of Public Health has issued regulations that applicants who have travelled from or through the countries which have been declared Yellow Fever Infected Areas must provide an International Health Certificate proving that they have received a Yellow Fever vaccination. - The International Health Certificate must be submitted together with the visa application form. The traveller will also have to present the said certificate to the Immigration Officer upon arrival at the port of entry in the Kingdom. As for those nationals of the countries listed below but who have not travelled from/through those countries, such a certificate is not required. However, they should possess concrete evidence showing that their domicile is not in an infected area so as to prevent unnecessary inconvenience.